Every class has students who play certain roles. You have your class clown, your queen bee – the one everyone wants to be friends with, a rebel without a cause, shy students, plus a few other roles. When I went through my training in undergrad, I was taught strategies to use with discipline problems, gifted students, English as a Second Language Learners, but I don’t remember having a professor discuss ways to meet the needs of shy children. *BEGINNING OF THE DAY: Greet them when they come in the room with a simple, “Good Morning!” Do not ask them questions, get in their personal space, or push them to talk to you. For very shy children, it will be baby steps. They may acknowledge your greeting by shaking their head, smiling at you, making eye contact, and eventually whispering hello. It is a slow process. Give them time to warm up to you. *COOPERATIVE LEARNING: During cooperative learning activities, pair shy students with students who are a little bit more outgoing. But do not pair them with a student who is over-the-top outgoing. These students will overwhelm your shy ones. *FOSTERING FRIENDSHIPS: Ask shy students to run errands for you at the beginning of the year and send them with a buddy. These quick trips give them a few minutes to get to know a buddy and hopefully make a new friend. *LUNCH & RECESS: With primary grades, the first few weeks of school, we draw names out of the bucket. I have a bucket of boy names and a bucket of girl names. I draw 2 names out at a time. These 2 students are buddies for 2 days. They sit by each other at lunch and play together at recess. They can play with other buddy pairs, but they have to stay together for 2 days. Every other day I would draw names again. By the end of two weeks, each student has been a buddy with 5 students. Hopefully, they will “click” with one of the five students that they have been paired with. **Please note: I draw two names, I do not draw one name and let a student choose a buddy. We’ve all had an experience once or twice in our life when we were the last one chosen. Why give your students that experience? *INSTRUCTION TIME: Call on shy students when they either raise their hand or when you know the subject is their strength. Overtime, they will build confidence by sharing when they have the correct answer and take more risks to share during other lessons. This is a very wise post. I have an extremely shy student this year. Those buddy buckets sound like great idea on this last days. I was thinking about a particular student of mine as I read this. I'm a mom with an introvert kiddo. We have managed to survive through 7th grade, but it's not been easy. School is brutal for introverts. I just wanted to add that the buddy buckets are a nice idea, but sometimes an introverted child may need recess/lunch time to be alone and recharge their batteries rather than being paired up with another child and trying to interact with them. Being alone isn't the same thing as being lonely or friendless. Some people, children included, just need some space so they can tackle the rest of their day. 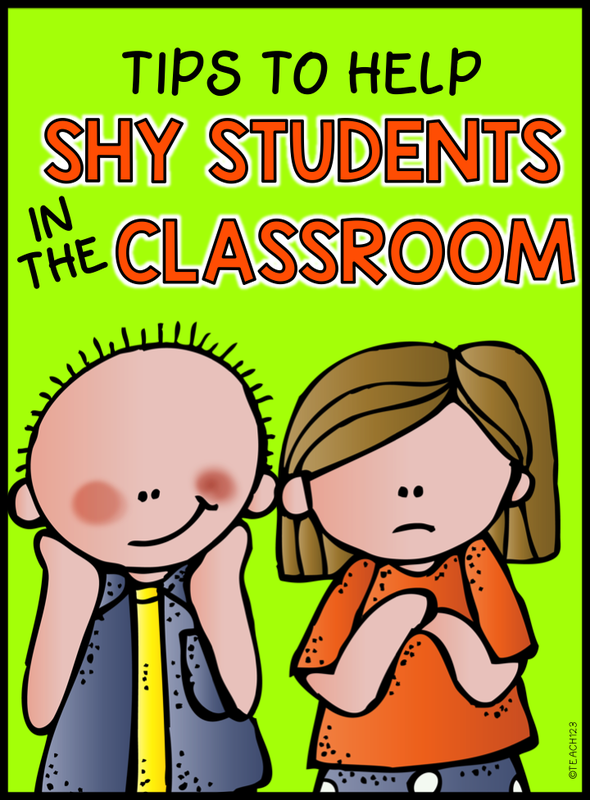 I love that teachers are actually beginning to recognize introverts and try to adapt classrooms. I get so tired of being told my son is shy. That's just absolutely not true. I very much like the idea of this post. We need to support our introverted kiddos a great deal, but not expect them to behave in the same way as our extroverted kids. Introverts require a much different approach and require different support than their counterparts. The ideas herein are good ones and, as an introverted teacher, I really like the "not getting into their space" approach. Introverts have a lot going on in their heads and it's not that they are "shy" but that they are most comfortable thinking inwardly than speaking outwardly. This is such a great tool! I'm not a teacher, but rather a parent of an extremely shy child. This makes sense to me as a parent, but for a teacher with so many different personalities in their classrooms I can't imagine how they would just know what to do! Thank you to all of you who are patient and compassionate to the needs of shy children. As my child says, " I don't want them to not like me, I don't want to do anything wrong.". They have a huge need to please their teachers. I know this is a bit late but as an introvert I think Susan Cain sums it up in her TEDtalk. I was that child at summer camp and can relate to about everything she says. Well worth the time to watch! Studying today as a studen has turned out to be extremely easy due to various helping items, amond which students gadgets are. I glad I stumbled upon your post. I am a certified elementary school teacher but not until this year when my own son was required to go into pre-k to have more time to develop social skills did I finally realize and accept the importance of it. Thank you for your post. My daughter is very shy. At home his is an outgoing chatter box of fun. But in large groups her walls go up. She started kinder this year and I've been looking for tips to help her and these are some great ideas to discuss/suggest during parent conference time. Excellent post! Definitely worth sharing. I'd just recently ended the parent -teacher conference, and one biggest concern shared with parents is their kids reluctance in class participation. I have bunch of shy ones in my class, and tried different approach to reach them. They tend to harmonized well with peers of similar personality, which is quite difficult working with collaborative grouping. I'd certainly try this one out. Appreciate your work on this, Michelle. Good aim! I was that shy girl in school and hated when teachers made me go to the board and write out a problem in front of my peers. Even if I knew it I just froze up there. Also had a teacher who instead of calling on children with their hands up he would call on those who didn't. I remember feeling like he always picked me and I didn't know the answer. Years later who would have known that the shy little girl in elementary would grow up to be a teacher herself. I love every one of your ideas Michelle. Wish I'd had you as a teacher. But one thing I did have was supporting encouraging parents. That seems to be lacking these days from Shannon–high school teacher in Arkansas. This is a great post! I love how you posted multiple ways of helping shy students in the classroom. I was a shy student so these would have really helped me while I was in school. Thank you!